How can I improve my business writing skills? Your ability to communicate effectively, persuade others, and motivate teams are influenced by your writing skills. While some people appear to be born great writers, others get there by practice. 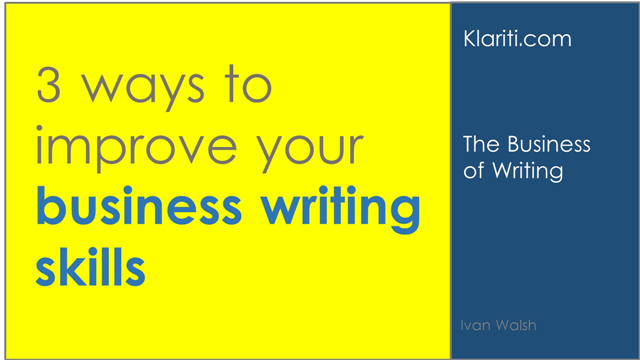 Let’s look at how you can improve your business writing skills. Be specific. Decide to improve one area of your business writing to start with, for example, email correspondence, white paper writing, or procedure writing. Give yourself at least one month, that’s twenty working days. Tell no-one. Keep your aim private. You don’t want others monitoring you or getting snarky when you write a typo. Let’s say you want to be a better white paper writer. Download five white papers you enjoy, print out the parts that impress you. Examine the writing. What works? How it is constructed? How does the writer get and keep your attention? How do they transition from one idea to the next? What analogies do they use? Which work best? Why? Now, try to write the text from memory. This may feel like cheating but it’s not. It’s teaching you to pay attention, identify what works, and recall – all important techniques for writing, especially when under pressure. Do this every morning before you go to work for fifteen minutes. If you commute, try it before you check Facebook. During lunchtime, set 20 min aside and write 200 words. After work, set 45 min aside and write 400 words. Actually, the word count does not matter. It’s your determination to stick with it that counts. At the end of the month, stop. Compare what you wrote at the start with what you wrote at the end. See a difference? Bet you do! Your voice as a writer is beginning to emerge. This is what we’re after! Now, go back and see where you made improvements, what worked, where you struggled, and what doesn’t read well. This is what you should work on next month. How much is your future success worth? $50 USD? Buy yourself two or three good books on writing. Which? Doesn’t matter as there are so many. What’s important is that you invest in your career. Don’t save pennies. But some books! Find the best writer on your team or department. Ask them if they will review what you’ve written. Most people will be glad to help. Thank them with a small gift or lunch if possible. Don’t be terrified of criticism. Change your attitude. Instead, look forward to it. The more you get, the faster you can progress. Don’t ask good friends for feedback as they will be afraid to hurt your feelings. Ask others. Actively seek feedback. How can I write this better? What would improve this? Try to develop a writing routine. If possible, write every day at the same place at the same time. Routine really helps. Buy a good keyboard so you don’t hurt your fingers. Stick to the routine, if possible. Don’t skip a day. Read with a pen in your hand. Why? Take Notes. Write down ideas. Be active when reading, not passive. Analyse what’s in front of you. Go back and re-read great passages of prose to get a feel for what works. Be patient. The journey of a thousand miles begins with a single step. Be grateful to those who help you. Did that help? If so, please click the Twitter, Facebook or LinkedIn buttons.